Dec. 18, 2018: When NASA’s New Horizons spacecraft flew past Pluto three years ago, mission scientists watching the first close-up images were shocked. Despite being stuck in the deep freeze of the Solar System 6 billion km from the sun, Pluto was not the frozen-stiff world many expected it to be. The geography of the dethroned 9th planet was alive with mountain ranges, windswept dunes, bladed terrain and much more. In one quick flyby, New Horizons turned planetary science on its head. Get ready to be shocked again. 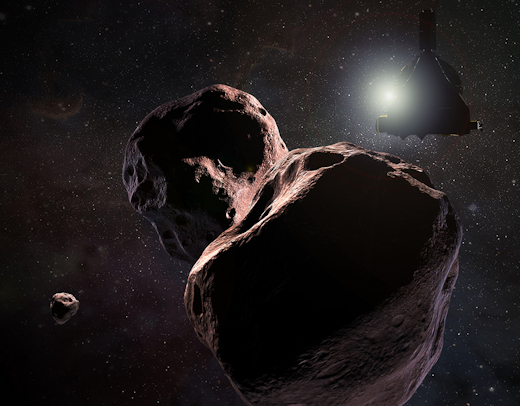 New Horizons is less than 2 weeks away from a new world even more mysterious than Pluto. Take it a day at a time, or by the hour if need to, but you must trudge through the time. Moments of dred followed by moments of learning. Moments of insecurity followed by moments confidence. Moments of panic followed by moments confidence. Moments of self-loathing followed by moments of self-appreciation. Moments of feeling worthless followed by moments of self-value. Moments of despair can be followed by moments of hope. So hold on. Never quit. A few videos for some reference, and maybe some moments of hope for you too. smile. I can’t believe a whole year has passed since my last post… Not much of a surprise really when you live every day out in the zone some place. In at least one regard, it seems like the last year had been somewhat of a break, after the exhaustion brought on by the constant survival mode and living on the edge of existence. If you have any kind of a ‘moral support system’, as in family and friends, count your blessings. My support system is practically non-existent. On rare occasions, I’ll touch base with a neighbor. Not intentional avoidance, but more that paths seldom cross. I have no contact with 99% of my relatives. This is including biological, adoptive, and other-wise, are all history as well. Some by my choice, some by their choice, and some by nature’s choice. On some days when the feelings of my loneliness might become noticeable to me, I’m reminded of the comforts that are found in the solitude that surrounds me. Living in the silent absence of all the drama… It’s a good place. A quiet place. A peaceful place. It’s the kind of place where at least no more injury is likely to occur. There’s even a chance that some healing might take place as well. Maybe? Coming to grasp with a concept can be tricky… Essentially, I’ve lived a whole life. Now I find myself looking at one tomorrow after another with no idea of which way to go or what to expect. It’s not what I’d call feeling lost. There are so many directions to choose from! So many that have to be weighed, evaluated, and vetted! It easily becomes an overwhelming task just to decide ‘what to do next” and then do it. Small things, everyday things, maybe as simple as making a phone call, can become something to just avoid and put off. Routine? What’s that? Schedule? I’ve heard legends about those things. Deciding what needs to be done, what can be done, and when it will be done, becomes a real process. Having a dog really helps! Most days, things run largely according to the dog schedule at least. Dogs need to eat, go outside, be fed & get water, vet visits, some play time, and some grooming. Also, dogs seem to have a way of knowing when you need to be pulled out of the zone too. Having a person in my life is something that I’ve often thought that I might want, and maybe even find some mutual benefits with. Then again?… Probably not. My dog has needs and can be demanding at times, but that’s OK. Dogs generally don’t judge, demand, rant, get angry, or ignore you. If a dog bites you, hurts you, it has a valid reason. People… They don’t need a reason to hurt you. Not even a real one. Out there, somewhere, there are those that are able to understand and appreciate everything I’ve written here. They are rare though, I believe. In my rare travels out in to the world, mainly only for necessities, I occasionally recognize something in someone that I can relate to. Unfortunately, it just makes me sad because normally they have no clue, nor understanding and comprehension, of their brief moments I’ll call ‘wake-fullness’. They’ll just shrug off things instead of letting them sink in, and thereby obtain and appreciate the value in them. To those people, I’ll make an extra effort just to be kind to them, and then let it go. Yeah… Rambled all over this road, I did! Sorry about that. It has been a whole year, and there is still much to be said, to be written about. When the rivers begin to run high in the spring, the water can get a little foamy and disorganized just below the dam. Seems like this has been somewhat like that? Just one thing… Call it a Flash Back to some days gone by, I guess. Those that were there will know. hahahaha Otherwise, do your best and carry on. OK? Until next time. and yeah yeah yeah yeah, hahahaha you got the evidence! Life is a journey. It’s more so about the trip, and not so much the destination. So I’ve been heard and have been told many times… There seems to be a lot of truth in this. I’ve spent the last few years mainly in what I’ll call “Empty Places”. Much of the time, I spend alone. There are times when I would relish some company, some conversation. But most of the time is spent just being alone, yet not in loneliness. I’m grateful for my peaceful spaces, physically and emotionally, and I spend as much time there as is possible. It’s only been in the last few years that I’ve spent enough time digging down inside, getting as close to the bottom of “why” as I possibly can. A journey of discovery in a way, and that is seeing things, recalling things, and understanding things, in hindsight. The roots of many things that have troubled me in life, and still do in some ways, run deep. I was a child at one time, but it didn’t last very long. By the time I began grade school, I was already operating on “another level”, much different than my peers. I can cite probable causes, but that may sound like me assigning blame and responsibility to people. In fact, it was a much larger set of circumstances, a true comedy of errors, and there were many characters and players in those circumstances. Adults and other children, the times being the 50’s and early 60’s, and myself already being so disconnected because my journey had already begun without my realization. Always on the outside looking in. That’s the best way I am able to describe it. Never fitting in, never feeling accepted, never feeling a true bond (except with dogs and other animals). I understood what loyalty was, but at best that can be a fleeting thing. A change in circumstances beyond your control, and loyalties can change greatly and suddenly. That’s how people are. That’s not a bond. A true bond endures changes, good times, bad times, and ages gracefully. I’ve never felt that. That is, a real bond. Except with a dog. I’ve been told I have PTSD and a major depressive disorder. Great… At least I have a label and somewhat of a definition of what’s been going on all along now. Gaining some understanding of ones self, is well… Progress? But towards what? Instead of trying to cure us, fix us, judge us, shut us away… I’d suggest recognizing the good in us, the things of value from our unique perspectives and experiences? Take an inventory of our good qualities, and of the benefits we have brought in to this world. There is much understanding, compassion, kindness, to be had because we tend to transmit just what we’d like to receive. We just don’t do very well in circumstances filled with conflict, anger, and meanness, especially when we get blamed for it being that way. Look beyond the end of your noses… See the person inside, and you might find something special. I look back now, and I have hard time seeing myself at all. Except that I’ve been in survival mode much longer than I ever realized. I guess, if anything, I have the one accomplishment of not having succumbed to life’s BS and letting it snuff me out? Maybe I’ve always been meant to be just a “place holder”? A thing to keep other things from bumping in to one another? I don’t know… That’s the best I can do to describe it. What’s up ahead for me now, hearing 62 coming up the walk towards me? I’m hoping it won’t be more of the same of what I’ve been living all along. But, statistically speaking, and in spite of holding on to some faint glimmers of hope, I’m not expecting much. Some day, this will all be done. Finally. The lights will go out for the last time, and I’ll be on my way to whatever, if anything, awaits in the hereafter. Most people, many people, live their lives in fear if dying. I don’t fear it at all. In fact, it will be a welcome change of pace. I’m in no hurry to get here though! So please don’t get the wrong idea. I’m just saying that if anything, being as I am and have been, You can’t loose nor miss what you’ve never had. Almost 62 going on 12…. March is a very busy and eventful month! Holy crap Batman! Break out the Bat Calendar! Then just about a week later, it’s St Patty’s Day! woo-Hoo!!! No extra pay or extra breaks, but usually there was at least a few “patrons” that provided some impromptu entertainment of some sort. Which was usually related to a high BAC rather than how Irish they were. Always at least a few laughs. Then just one more week later, spring in to spring! The Equinox, First Day of Spring, big holiday for the druids and others of course. The best part was that by that time, I was usually driving home in the sunshine now, with the shift ending early in the morning. The bad part was driving east… Sunshine in your eyes. That’s also when windshields got cleaned, inside and out, because with the sun glare it was worse than fog… Complete “white out”. Like trying to drive with your windshield covered in white paper. Not having a TV for over a year, and having slim choices on the number of stations I could get on my vintage 70’s clock radio with the FM band, I spent a lot of time listening to central Wisconsin NPR. I heard about Leonard Cohen’s release “You Want It Darker?” that way, and immediately it became a favorite of mine. Not very long afterwards, Mr Cohen passed away, God bless him. You can look him up easily, and you may be surprised about how much this musical legend gave us. That’s up to you, but I sincerely recommend it. Before you watch the following video, just a short bit of information that should make the video more understandable and enjoyable, as there is a “context” necessary to understand and appreciate the word “Hineni” used throughout the song. Not understanding what this word is and it’s meaning would be like going to see “2001: A Space Odyssey” without reading the book first. Yeah it’s like that… Take the time for a short lesson, and you’ll probably really enjoy the song and video SO much more! and now the song and video…. Halfway through 61 now. Well almost… Now that I can do things again because I can, I have no clue on what it may be, that I would like to do. Thought about building a time machine. Same old, same old. Even if I had a time machine, where, or rather when, would I go to? Sure nowhere, nowhen, in the past. Been there, done that. I’d probably just hit some random date, at least many decades in to the future, and see what’s there when I got there. Hopefully, they’d still have coffee. What is a body to do when the opportunity comes along to begin anew with a “clean slate”? No baggage, except for a dog for now and she’s old now too… No whining needy kids, or backstabbing relatives of any kind to speak of. No one from high school, or any other school, lurking in the wings. I haven’t had to mail out, or been able to mail out, a single Christmas card for years. No birthday cards going out, none coming in. No anniversaries to remember. Only recently got reconnected to the internet, cable TV, and a landline phone too. I was feeling “disconnected” after going without for about a year and a half. Now I’m connected again. A very few friends, a bio brother, a bio nephew, couple of cousins, and that’s about it. Talk with my brother the most. The rest, well they know I’m here and I know they’re there. Everyone has something going on, a life, so they’re pretty busy. That’s OK. A few minutes on a phone, or a message here and there, isn’t much but it’s better than zero. I can’t complain, because it’s about all I can handle anyhow. Too much company, too much connection time, just makes the loneliness darker and deeper in between. Still living rough, I guess because I’ve gotten so used to that it’s become normal now. I could easily spend some time traveling around the country once the weather gets warmer. Getting stuck in snow storms, or having roads get shut down, just isn’t much fun. I could make some further improvements to this house, like maybe getting a few windows fixed, a stove to cook on, or even a window A/C or two. But why? Making my self-imposed sanctuary more comfortable would be a little counter productive. There would go much of my motivation to just go out the door and in to the great outside`on most days. I have my moments of hopefulness. I just don’t let myself become to excited over them these days. Hopefulness is too often just the prelude to more disappointment, which refuels and resupplies my depression. Status Quo is a safe place. You may not go up, but you really don’t go lower either. It’s safe, and fairly consistent. If I was going to snap, to break, to give up, it would have happened by now. At least that’s what I believe and hold on to during the worst days. Maybe someday, I’ll get lucky? I doubt it. At least in the meantime I play this game that my life has become, it’s called “Survival”. And for now, it’s all I got. This is going to be a more interesting year at least, I hope. Maybe a road trip or two? I have time to think about it. I have time, and I at least know that. I just have to think of a destination or two. Cold and getting colder. Snowed in just a little. About all I have left is hope and a mile wide streak of stubbornness. Dauntless. Depression is not fun, but sometimes it’s the only company you’ll have. Maybe some day… Hopefully, I’ll be ready to be ready.